It was said that John Oldfield made Wolves history by saving penalties in successive games against Arsenal and Liverpool more than 40 years ago. What is surely beyond any doubt is that he is unique in performing such unlikely heroics and then being dropped for the next match. Strange things clearly occured, though, in 1969-70. Not least the fact that Wolves started the First Division season at a gallop with four straight wins and ended it with a stagger and no victories in 13. Amid this alarming slump, it appears Bill McGarry suffered a little indecision with his goalkeepers. Oldfield played 13 games in a row from the day of his debut in a 3-1 League victory at Burnley on January 10 of that season. On the face of it, you might have thought his position was even more secure after he had plunged to keep out Peter Storey’s penalty in a 2-2 Easter Saturday draw at Highbury and then stopped an even more powerful kick from Tommy Smith at home to Liverpool two days later. The Merseysiders may have won at Molineux, with Oldfield partly to blame when Chris Lawler stole in to score. But this was no slaughter of Boswell-Evans proportions from a season and a half earlier. That one had finished 6-0. This was only 1-0 and, as a consequence, Phil Parkes probably expected to be on the outside looking in for a little longer. But the local boy was recalled at West Ham for Wolves’ third game in four days – and was not above criticism in a 3-0 beating. And, when he also figured in a 2-0 defeat at Derby the followed weekend, the manager sent once more for Oldfield for the season-ending 1-0 loss against Coventry. The chopping and changing continued. Oldfield was the chosen man for the subsequent three-match early-summer tour of Yugoslavia despite Parkes’s presence but his rival returned for all four matches the club played in the Anglo Italian Cup in June. And there was to be one final twist……. Having played the first five games of 1970-71 – and conceded 14 goals in the process – Oldfield was dropped once more, never to be seen again at first-team level at Molineux. Like Alan Boswell before him and Gary Pierce later, he was substantially outlasted by Parkes after presumably being signed to replace him. Not that anyone can suggest McGarry was alone in having a high regard for a man who was born in 1943 at Lindrick Golf Club – the venue for Great Britain’s Ryder Cup victory over the Americans in 1957 – after its clubhouse had been converted to a war-time maternity hospital. 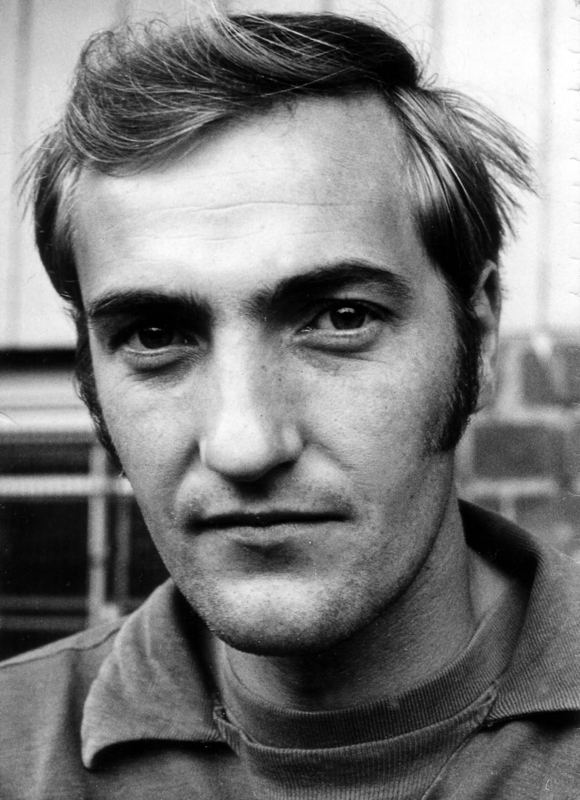 Having emerged from Sheffield junior football, Oldfield became a favourite at Huddersfield, where Derek Parkin, Bob McNab and Mike O’Grady were team-mates and, some time later, Ian Greaves was his manager. O’Grady and Parkin were then waiting to welcome him to Molineux when he was bought in December, 1969. The fair-haired six-footer made his Terriers debut at Swansea Town in 1963 and appeared in 40 of his club’s 44 League and cup matches in 1966-67 – a campaign in which they proved durable opponents to a promotion-bound Wolves in 1-0 defeats on successive days at Easter. The following season, Oldfield was an ever present in all competitions as Huddersfield reached the semi-final of the League Cup for the first and so far only time, only to then lose 6-3 to Arsenal over two legs. It was at the start of that cup run that he impressed in a 1-0 home victory over newly-promoted Wolves. With the signings of Terry Poole from Manchester United and David Lawson from Bradford Park Avenue, though, opportunities became few and far between. And the appointment at Molineux of former Huddersfield wing-half McGarry, who had been at Leeds Road when Oldfield was a young amateur there, was followed just over a year later by the keeper’s arrival on this patch for £25,000. We delayed posting this piece while we checked the reports that Oldfield was no longer with us. Wikipedia state that he died in 2002 but we sent a letter at the weekend to the Huddersfield Examiner to try to make sure this was the case – and have received confirmation several times over to that effect. One of the callers to whom we are very grateful is Huddersfield fanatic Alan Milnes, who has his own personal recollections of a player who was something of a hero to him after his 150-plus appearances for his local club. 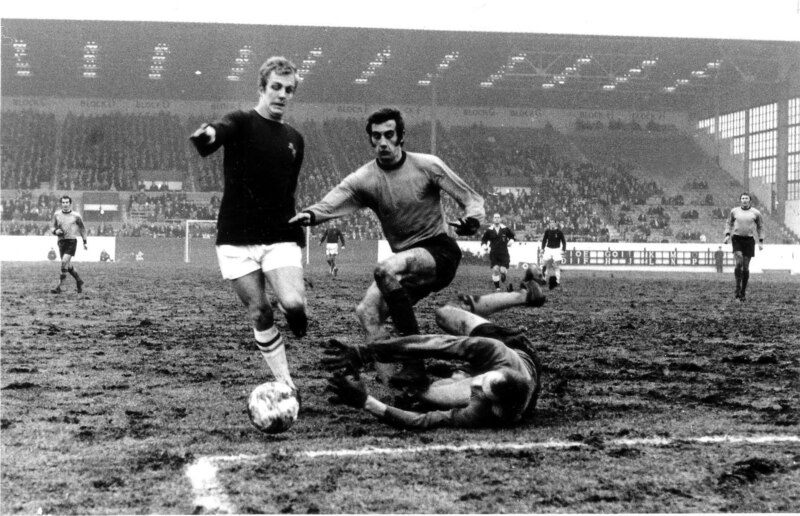 John Oldfield, watched by John Holsgrove, plunges into the Turf Moor mud on his Wolves debut. In the background are Mike O’Grady (left) and Mike Bailey Photo by Howard Talbot. “My dad and my uncle were drinking buddies of John’s and my dad was close enough to him to suggest we took him to his first Wolves game,” he said. “I was surprised to learn this week that it was a Boxing Day fixture at Manchester United but I recall us taking him to a hotel in Cheshire and, as a starry-eyed lad of ten or 11, being thrilled at seeing players Derek Dougan and Dave Wagstaffe in the flesh. Oldfield had signed on Christmas Eve, having become the father of twin boys two months earlier, and was not eligible to play at Old Trafford. Parkes performed brilliantly there in a 0-0 draw. The following game, at home to Coventry, was postponed because of the wintry weather but change was in the air after Wolves, on the afternoon that Dougan returned to the first-team fold following a controversial ban that had stretched to nearly ten weeks, had been humbled 3-0 in the FA Cup at Burnley. Oldfield’s first-team involvement with Wolves was all over after 19 games that spanned some eight months. Pierce would arrive a couple of years later and the man McGarry had seen as first-choice material before him was moved on. First he joined Crewe on loan then, after a handful of games for them, moved permanently back to West Yorkshire by joining Bradford City, where he played 34 times. 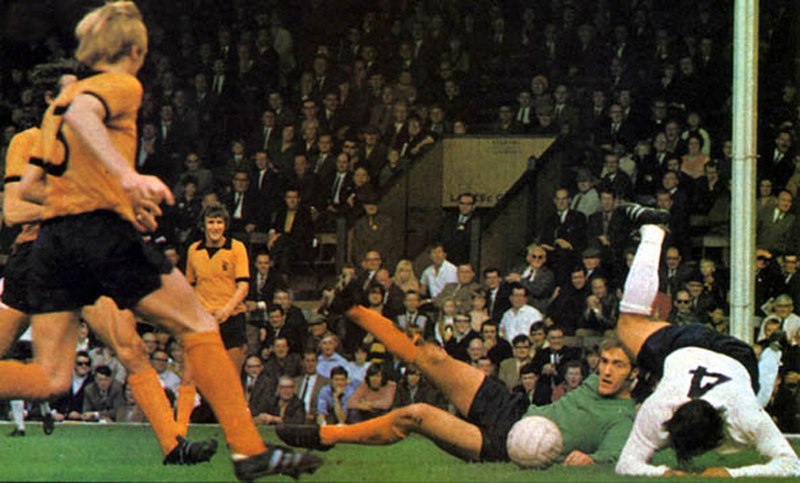 Oldfield in action against Spurs in August, 1970, in his final outing at Molineux. Having been known to enjoy a pint in his time here, it would have surprised none of Oldfield’s Molineux team-mates to learn that he ended up in the pub trade. Another of those to respond to the Huddersfield Examiner piece was a butcher from Leeds who said John had kept a sports and social club not far from him. He also said two of the keeper’s offspring had bought their meat from him on occasions. Wikipedia say that Oldfield Snr died in Leeds but if any of our readers have more information on his post-Wolves career, we would be delighted to hear from them. Posted on: Tuesday, September 3rd, 2013.